Notice Mickey Mouse’s eyes, how they’re different than Minnie Mouse’s. Walk around characters had been using the non-screened eyes for several years, but the Mickey chosen for this photograph uses an older form of the costume. Notice Minnie Mouse’s legs and shoes? 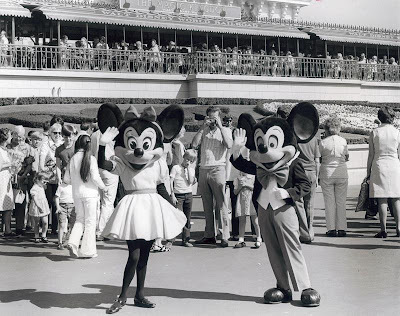 Today, Minnie’s skirt would be longer, revealing less of that slender leg, and her shoes would be oversized in order to complete the cartoonish ensemble. Notice the wardrobe of the guests; the 1970’s camera equipment; the simplicity of the planter? All of that is great and really sets this photograph in 1978 when and where it was taken. But you know what? Some days the history and details don’t matter, some days you just want to see old friends and give them a hug. 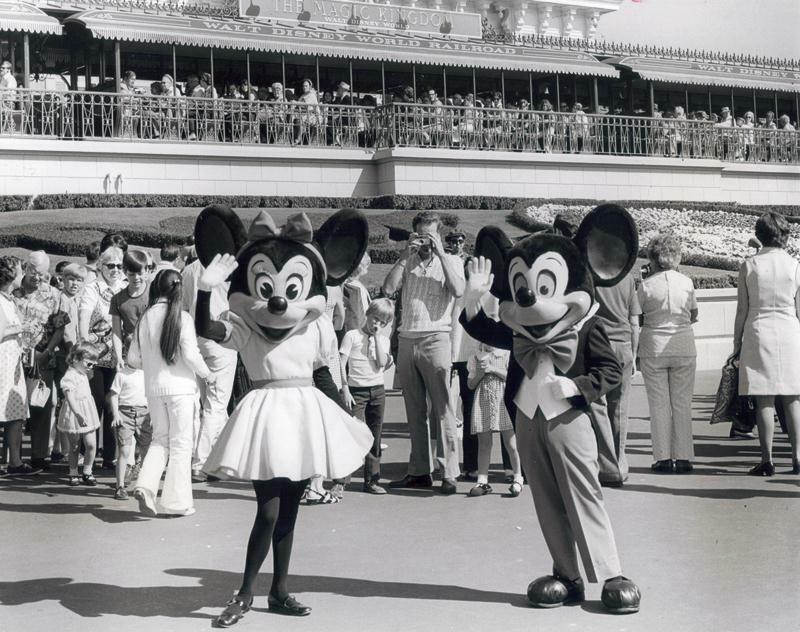 Whether it is Mickey and Minnie in 1980’s rainbow spacewear, the classic polka dot dress and tux, or even the safari gear of Camp Minnie-Mickey, there is nothing better than sharing a moment with the Mouses. I bet Minnie was not overly excited to give up those simple black shoes and don the big, yellow heels. You are correct though, sometimes it's all about seeing your friends - no matter what they are wearing. That is a fantastic archive shot - and you are so right, Ryan, it's about friends being timeless.